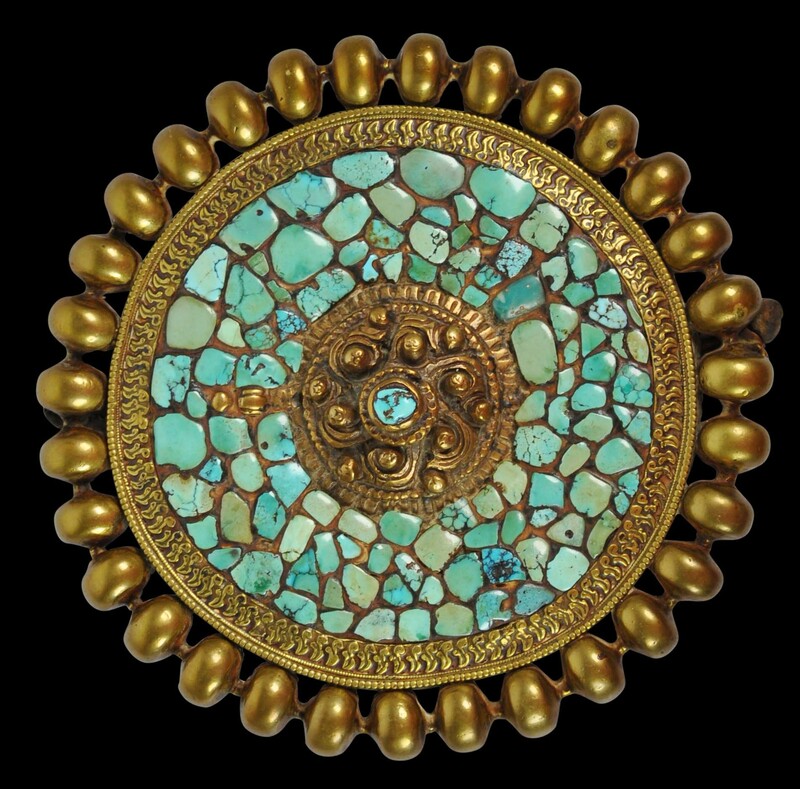 This large, heavy medallion-like pendant is a chest ornament designed to be worn by an image or statue, probably a Buddha image or that of a related deity, in a temple or monastery. It is of gilded brass and copper with an engraved backplate engraved with a double vajra emblem. The front is inlaid with dozens of turquoise chips worn smooth with age and handling, around a central raised, gilded section which rises to a finial that also is inlaid with turquoise. The edge of the ornament is decorated with 31 prominent, gilded, flattened spheres. 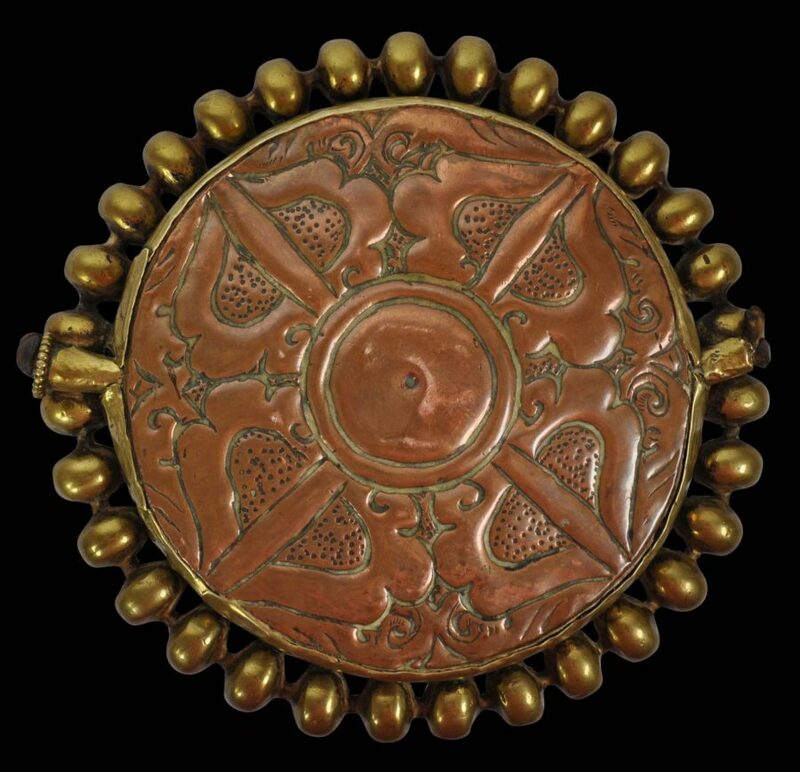 Clarke (2004, p. 115) shows a pair of large earrings attributed to the 18th or 19th century Kathmandu Valley and which most probably were intended to be worn by an image and these have similar edging to the ornament hear. Ghose (2016, p, 77) shows a hair ornament which also has similar decoration. There are two gilded lugs on each side with remnants of old leather strap which would have allowed the heavy ornament to be suspended from an image. The ornament has clear age and a fine, worn patina from use and handling. There are no repairs or replacements. Clarke, J., Jewellery of Tibet and the Himalayas, V&A Publications, 2004. Ghose, M. (ed. ), Vanishing Beauty: Asian Jewelry and Ritual Objects from the Barbara and David Kipper Collection, Art Institute of Chicago, 2016.